Phase Line 'Birnam Wood': Hold On. This Will Be A Bumpy Ride. Passed along by Gerard Vanderleun. 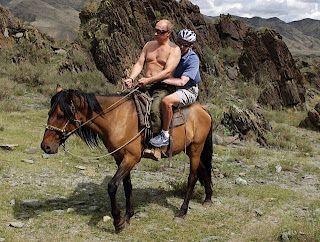 And incidentally, it's been a while since I spent a good amount of time in the saddle (and none on a Mongolian pony), but Putin's grip on the reins seems a bit severe. Maybe some control issues? Our press jokes about the photo events that are staged for Putin's benefit, but they miss the point that for the Russians and a good number of other people in the world, it works.